Our organization has several strong relationships within the community- one of the longest standing being with Habitat for Humanity. Through their program, residents with us have the opportunity to qualify for a Habitat house by volunteering their time to help others build theirs. 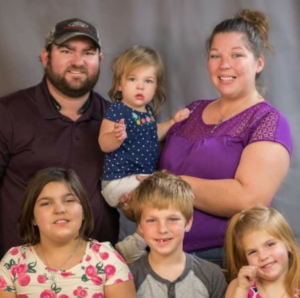 Tim, Tracee, and their four children applied to Community of Hope in March of 2017 because the rental in which they were residing was being sold. The owner of the house gave them very little time to find a place. 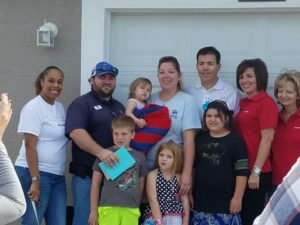 Although they were waiting to break ground and build their Habitat for Humanity home, once their rental was no longer an option, they had no other place to live. We stepped in and talked to their landlord, getting them an extension so we could conduct an interview and finish the work to get the apartment ready for them to move in. On June 1st, 2017, they made the move to Hope Village. During their time with us, they continued working with Habitat to help other families build their homes while waiting for the ground to break for their own. Finally, the day came and there was a wall raising ceremony at the end of July. From there it only took a matter of months for the house to be completely built and the ribbon cutting was on January 27th, 2018. Through their hard work and our relationship with Habitat for Humanity, another family was able to find long term affordable housing and stability- it is a partnership that we hope to continue for a long time coming!